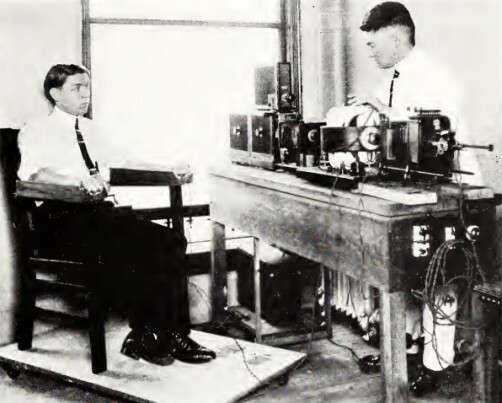 Chicago’s first electrocardiograph was installed 100 years ago at Presbyterian Hospital, which later became part of Rush University Medical Center. Renowned heart specialist and Rush Medical College graduate James B. Herrick, MD, was instrumental in securing the equipment through a gift from Mrs. Cyrus McCormick, Sr., a noted Chicago philanthropist. She also helped the hospital acquire an improved model in 1915 and provided substantial funding for research in heart disease. Electrocardiography measures the heart’s electrical activity and helps detect abnormalities. This entry was posted in Heart, Rush Archives and tagged American Heart Month, Chicago history, electrocardiograph, heart disease, james herrick, presbyterian hospital, Rush Archives, rush medical college. Bookmark the permalink.